This was a big, big week for me! Wednesday - 9 miles avg pace 9:50 OUTSIDE! Yahoo! Yippee! Woot woot! Not only is 20 miles a PDR for me, 49 miles is my highest weekly total. Since I skipped my long run last weekend, I squeezed it in on Monday night. With the extra hour of sunlight after work, you would think I would take advantage of it and run outside, but I've been a weenie lately and went to the gym because it was cold and drizzly. Totally lame on my part. But I got my run in on the treadmill. 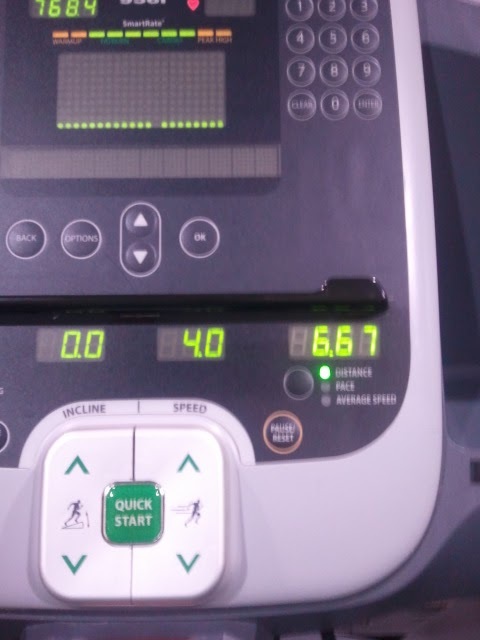 I took a break about halfway through to walk around off the treadmill, go to the bathroom, etc. before hopping back on and whipping out another 6.5 miles. The Biggest Loser was on so that helped distract me. On Wednesday, I hemmed and hawed about going outside for my run, but after a text from my friend Laura (who is also running this marathon), I got out there and ran. This was supposed to be a 10 mile run, but it was already very dark at mile 9 so I called it good. I tried to pick a route that I knew had street lights and was heavily traveled so I was never running in the dark alone. This approach was mostly successful except I forgot that the main road leading back to my apartment is not lit. This road is a 4-lane road that I would consider to be fairly major so I don't know why there are no streetlights (way to go Arlington Heights). Thankfully, I only had to do a mile on this section and made it safely home, but I seriously had to stop and walk at points because I couldn't see the sidewalk. Thursday's mile repeats were hard. Turns out my legs were a little tired from the 22 miles I had already run this week. Bailing on the last mile repeat seemed like a great option, but I powered through by telling myself it would be worth the great feeling afterwards. It was. Since I had taken a rest day on Tuesday, I decided to do a workout on Friday and not take my usual rest day before a long run. A decision I quickly regretted on Saturday morning when I woke up with sore glutes. 20 miles is scarily daunting to me, but I just headed out and told myself to take it 1 mile at a time. Matt agreed to come pick me up if I was dying on the side of the road. Cascade is hilly and not that big so I ran some of the route twice. The hills were hard and I was s.l.o.w. and I walked up my fair share of hills towards the end. But I never felt like I couldn't complete it and I finished. I could also now write the book on how not to recover from a 20 miler. I spent about 5 minutes stretching and attempting to ice my knees before my mom insisted that I get in the shower so we could go to Dubuque. We spent hours standing and walking around and my feet were killing me. On the bright side, all the walking really helped my legs and I didn't have to deal with much post-run soreness on Sunday. On Saturday night, I wasn't much fun at the bachelor/ette party because all I wanted to do was sit with my feet up and snack. My motivation has returned and I am feeling pretty good about the marathon this week. I am excited to tackle the rest of my plan! 6 weeks to go!